New York, May 9, 2011 – Harvestworks Digital Media Arts Center announces the 2011 New York Electronic Art Festival (www.NYEAF.org) on Governors Island in collaboration with River to River Festival, Trinity Wall Street and Governors Island National Monument, Roulette and other partners. 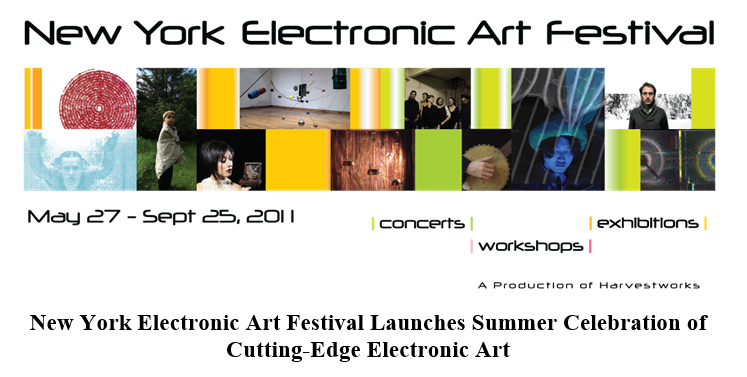 The festival is a summer series of concerts, workshops, and exhibitions centered on the cutting-edge work being done at the intersection of art and technology. Open hours are 11 am – 4:30 pm, on Friday and 11 am to 5 pm on Sat / Sun from May 27 – September 25, 2011. For the first time the Festival will take place outside of galleries and concert halls, and will explore the geography of the island through sound and related technology, re-imagining the architecture and history of the spaces. Some of Governors Island’s public spaces will be transformed into a series of sound landscapes where the public can appreciate a new dimension of the visual and auditory environment. Harvestworks’ New York Electronic Art Festival presents innovative work made with the most advanced technology that is rapidly altering the conditions of our lives. The festival will focus on the way that technology can alter, expand and exhilarate our perceptions through the creative energies of the artist. Blue Morph an interactive installation by Victoria Vesna in collaboration with nanoscientist Jim Gimzewski that uses nanoscale images and sounds derived from the metamorphosis of the Blue Morpho butterfly at the St. Cornelius Chapel . …The piece fully emerges in sound and pattern only when the participant is STILL AND SILENT— the artists. WaterWall a sound installation by John Morton and Jacqueline Shatz that creates a musical, spacial, sculptural, and theatrical link to the urban experience of water in Liggett Hall Archway. This is a new work by the creator of the “Central Park Sound Tunnel”. an exhibition featuring exciting digital media art works by Lisa Kirk, Alex Chechile, Louisa Armbrust, Brendan Fernandes and opening on June 17th, a new work by CCRT (LoVid and Doublas Repetto. The works offer visitors a transformative and informative aesthetic experience. Rainforest V (July 1 through July 31) a master sound art work which is at once a sound sculpture and an orchestra of resonant instruments conceived by the late David Tudor and realized by John Driscoll, Phil Edelstein, and Matt Rogalsky of Composers Inside Electronics at Governors Island National Moument in the magazine of Fort Jay. SPECIAL PERFORMANCE JULY 30. ( (( PHONATION )) ) is a multimedia solo performance by Bora Yoon with live video manipulations by Luke DuBois exploring where sound connects to the subliminal using found sounds, new and antiquated instruments, electronic devices, gesture, and voice. “Bora Yoon is a 2010 Harvestworks Artist in Residence and an Artist Fellowship recipient of the New York Foundation for the Arts (NYFA). This presentation is co-sponsored by Artists & Audience Exchange, a NYFA public program, funded with leadership support from the New York State Council on the Arts (NYSCA). “Whirlpools” by Satoshi Takeishi – In a world parallel to the one we live in, there are energy points where the “visible” and the “invisible” create whirlpools, swirling bodies of energy, entrances to the infinite spiritual cycle known as “dreamtime”. Woody Sullender is a pre-eminent experimental banjo performer, playing with and against the cultural baggage of the instrument. While alluding to the “traditional” musics of his home states of Virginia and North Carolina, he explores a diverse plane of plucked string music from around the world while incorporating punk, noise, free jazz and drones as well. Festival Workshops and Project Presentations are scheduled throughout the month. Please check www.nyeaf.org and www.harvestworks.org for more information. – Carol Parkinson, Harvestworks Executive Director. ABOUT NYEAF: The New York Electronic Art Festival was created to provide a responsive public context for the appreciation of cutting-edge electronic artwork through concerts, workshops, and exhibitions of the highest quality across the arts and technology spectrum. Attendees will get an overview of how technology is being used in various artistic disciplines, and have the opportunity to take part in a discussion about how these technologies will continue to shape contemporary art practice. This year’s festival will be a showcase of exciting interdisciplinary work and serve as a catalyst for discussions and collaborations between artists, scientists, and the public. VENUES: The New York Electronic Art Festival will be held at venues including several sites at Governors Island, St. Paul’s Chapel, Roulette, and Harvestworks Digital Media Arts Center. Program subject to change. Check the website for the latest information. For any press inquiries please contact Carol Parkinson at 212-431-1130.